I was very kindly sent eight wax tart samples to try from Scentsy, I saw an advert for Scentsy while scrolling through my Facebook newsfeed and it looked really interesting. I love candles and scented home ware, so I definitely wanted to try Scentsy! All opinions and photographs are my own, for more information on PR and my disclaimer, click here. I will be splitting the review into two parts, here are the first four wax Scentsy tart reviews. 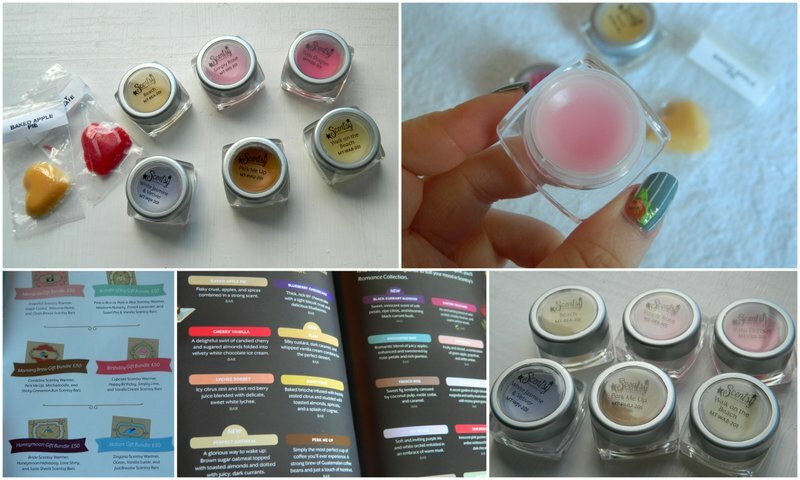 The wax samples come in really cute plastic containers for the most part which are great and you could reuse them, for example, if you haven't used up one wax tart you carefully pour it back into its container. Each small sample is half of a square from the large 8 square full size bars. Here are the reviews! *Baked Apple Pie: Along with floral scents, food/baking scented items are a winner for me. I wanted to try this one first as it did smell gorgeous in its package. After about four minutes the gorgeous cinnamon baked apple pie scent was noticeable - the scent is just divine. It is a heavenly mixture of vanilla, subtle cinnamon and baked apples. Strong but not overpowering scent which is surprising considering it is a small sample. ★★★★★, 5/5 from me! *Perfectly Pomegranate: Before melting it smells so fruity and very sweet - quite an artificial scent and like fruity lip balms. Scent became noticeable very quickly while melting in my tea light burner - a electric burner/melter is recommended, not a tea light one. After approx. 20 the scent is still strong which is really impressive for a small sample, this continued for around 2 hours! ★★★★☆, 4/5. *Perk Me Up: Along with Baked Apple Pie and the Simply Rose wax samples, this is one of the ones I was really excited to try. I LOVE coffee and I have been looking out for coffee candles but I have never found a nice one - until now. The scent is a mixture of vanilla and coffee, the coffee is not really strong in this wax sample, although I personally would have liked the coffee to be a bit stronger (but it was just a sample). A gorgeous scent for coffee lovers! It lasted for about 2 hours (over 2 days) and some yankee candle tarts and sampler candles I have tried haven't been as impressive as these sample from Scentsy have been! ★★★★★, 5/5. *Simply Rose: I couldn't stop smelling this one in its little pot, it's so lovely. Rose scented products can smell a bit old fashioned in my opinion but this one is sweet and fresh and divine. It is not overpowering either, the scent strength has been really impressive with all of these samples. I was a bit surprised at how much I liked this one! ★★★★★, 5/5. Labels: apple pie wax tart, candle samples, Lifestyle, review, reviews, rose scentsy, scentsy apple pie, scentsy bars uk, scentsy perk me up, scentsy review, Scentsy samples, scentsy uk review. Categories: apple pie wax tart, candle samples, Lifestyle, review, reviews, rose scentsy, scentsy apple pie, scentsy bars uk, scentsy perk me up, scentsy review, Scentsy samples, scentsy uk review. I love candles so I will have to check this brand out. They look like they have such a great range of scents. Great review. Perk Me Up sounds great. I love the scent of coffee, but I actually don't like coffee that much. A candle with a slight coffee scent is perfect. I've never heard of the brand before, but they sound really nice! These look adorable love the sound of the apple pie one! thank you for dropping by! would you like to follow each other?